A session was held this past Tuesday, by the Israeli Supreme Court, to discuss the appeal submitted by seven detainees who were freed among the “Shalit” swap deal and who were kidnapped last year, after the disappearance of three settlers from Hebron. The Wadi Hilweh Information Center in Silwan reports that the prisoners and their families asked the media and international organizations to attend the court session and discuss their case. The kidnapped prisoners wrote a letter stating: “The occupation forces rearrested us in June 2014 as revenge to the kidnapping of three Israeli settlers in the area of Hebron. They did not provide any legal justifications or an evidence to convict us. The prisoners pointed out that some of them were married immediately after being released in 2011 and some had newborn kids that they haven’t seen yet; note that most of the prisoners had already spent more than 20 years in Israeli prisons. 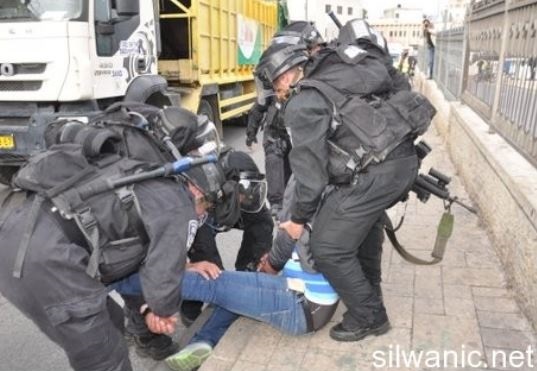 Lawyer of the Wadi Hilweh Information Center in Silwan (Silwanic) said the Israeli police violently attacked, and beat, on Monday evening, a child who was kidnapped in Wad al-Jouz neighborhood, in occupied Jerusalem. He said that the child Majd Ramadi, 16 years of age, suffered various cuts and bruises to the face, back and other parts of his body, especially after the soldiers dragged him onto the ground while abducting him. The child was moved to a hospital, as he needed stitches to his face and inner cheeks, and also suffered facial bruises, in addition to various cuts and bruises to his back, in addition a visible eye bruising. On Tuesday, the District Court in Jerusalem held a hearing in which the Israeli prosecutor alleged the child hurled a Molotov cocktail on the soldiers in Wadi al-Jouz neighborhood. The lawyer said, when the child was sent to court, signs of torture and exhaustion were clearly visible. The Israeli Occupation Forces (IOF) re-imposed Thursday the previous sentence of the female ex-detainee Haniyeh Naser who was re-arrested few months ago after being released during Wafa al-Ahrar deal. Palestinian Prisoners Center for Studies said that an Israeli court re-imposed on the ex-detainee Haniyeh Naser, 25, her previous sentence estimated at 28 months. Naser, who is currently held in Hasharon prison, was re-arrested from her family’s home on December 10, 2014 during an Israeli large-scale arrest campaign targeting Palestinian ex-detainees who were released during Wafa al-Ahrar swap deal in 2011. She was first arrested on September 12, 2011 at an Israeli military checkpoint for allegedly holding a knife to stab an Israeli soldier. Naser spent three months out of her 28-month sentence before being released in the swap deal in 2011. 24 women, including four minors and 4 ex-prisoners, are currently held in Hasharon prison amid very difficult detention conditions. Israeli soldiers kidnapped, on Thursday at dawn, eight Palestinians in different parts of the occupied West Bank, including four teenagers in occupied East Jerusalem. Media sources in Hebron, in the southern part of the occupied West Bank, said several armored Israeli military vehicles invaded the Shuhada Street, and kidnapped one Palestinian. The kidnapped have been identified as Mofid Sharabati; the soldiers violently searched his home, and several nearby homes, causing property damage. Soldiers also invaded Khallet al-‘Ein area in Beit Ummar town, north of Hebron, broke into the home of Yousef Mohsin ‘Awad, and searched the property causing excessive damage, before kidnapping his son Mohammad, 26 years of age. In addition, soldiers invaded Bani Neim and Yatta nearby towns, installed roadblocks and searched cars. Furthermore, a number of military vehicles invaded Toura village, in the Ya’bad area, southwest of the northern West Bank city of Jenin, broke into and searched several homes, and kidnapped two Palestinians identified as Nizar Wasef Qabaha, 21, and Amir Mahmoud Qabaha, 22. 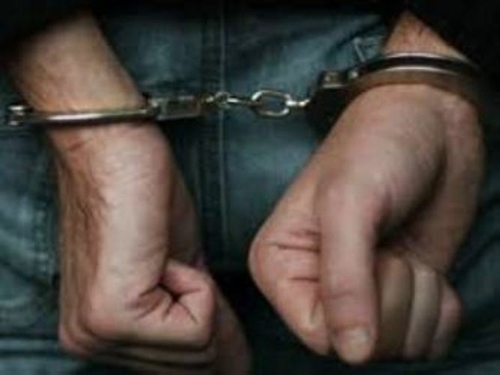 The soldiers also invaded a stone factory, south of Jenin, and detained several young men; the property belongs to resident Mohammad Khaled Kamil and is located near the Jannat Park. Army also installed a roadblock in the area, stopped and searched dozens of cars, and interrogated several Palestinians while inspecting their ID cards. In occupied Jerusalem, soldiers invaded Ras al-‘Amoud neighborhood, also searched homes, and kidnapped four teenagers identified as Ahmad ar-Razem, 16, Ahmad Nael ar-Razem, 19, Mohammad Sharawna, 17, and Amjad Dandees, 19. 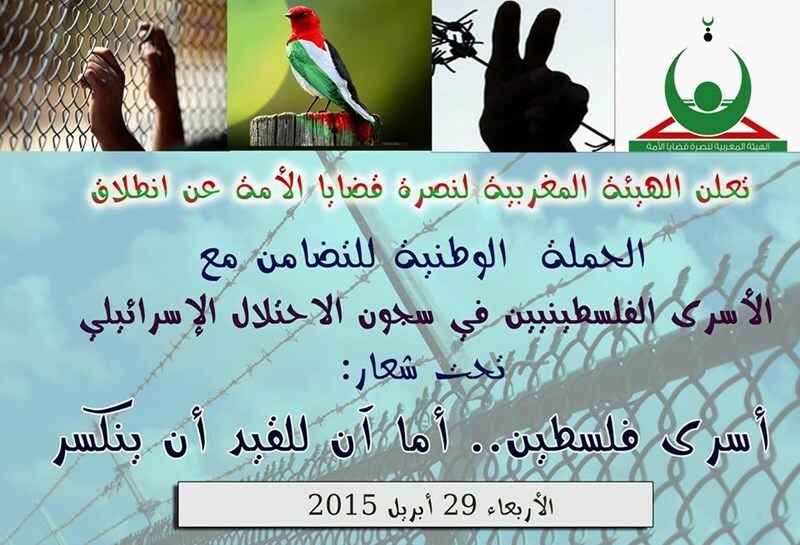 The Moroccan Committee to Support the Nation’s Causes announced the launch of the national campaign in solidarity with the Palestinian detainees held in the Israeli occupation jails. The campaign, entitled “Palestinian detainees. . . . Isn’t it high time the chains were broken?” was launched in the presence of a number of Moroccan pro-Palestine figures, including member of the central bureau of the committee Prof. Mohamed al-Riahi al-Idrisi. Speaking in a presentation delivered at the Faculty of Arts and Humanities of Bin M’sik, al-Idrisi instructed the audience on the need to develop a sense of duty and sincere commitment as regards the Palestinian cause. The Israeli border police arrested over 100 Palestinian workers residing and working in the 1948 occupied territories without permits. The captives are natives of the southern West Bank city of al-Khalil, an Israeli broadcast claimed. The Israeli occupation army has stepped up arbitrary abduction campaigns against the Palestinian workers who seek to earn a living in the 1948 occupied Palestine, where they have reportedly been subjected to mistreatment and incarceration. A protester holds a sign reading "No to collective punishment. Israeli polices forces violently dispersed a Palestinian protest in the occupied East Jerusalem village of al-Tur on Wednesday, amid complaints that authorities' closure of the village's main road is a form of "collective punishment" against locals. 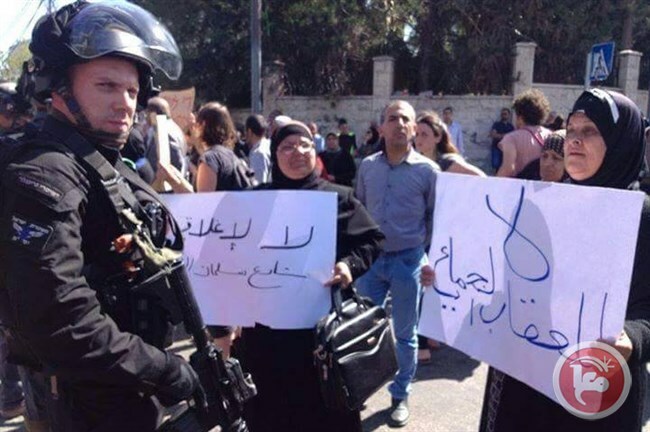 Sources told Ma'an that dozens of residents of the neighborhood on the Mount of Olives as well as foreign activists carried out a sit-in on al-Tur's main street to protest Israeli authorities' decision to shut down major thoroughfare Suleiman al-Farsi street with two concrete blocks. The street was closed earlier this week when locals protested against the death of a 17-year-old boy from the area who was shot dead after a scuffle with a soldier at a nearby checkpoint. Mufid Abu Ghannam, director of a local activist committee, told Ma'an that Israeli forces assaulted protesters on Wednesday and launched stun grenades at sit-in participants, injuring two people with shrapnel in their lower extremities. Israeli forces also reportedly detained two Palestinian protesters, Amjad al-Shami and Youssef Khuweis.Abu Ghannam said that even after protesters had dispersed, Israeli forces continued firing stun grenades at people in the area. Israeli police spokesman Micky Rosenfeld confirmed the incident, saying that police used stun grenades against protesters after they blocked roads in what he called an "illegal demonstration" in which "stones were thrown at police officers who were at the scene." Rosenfeld denied any injuries in the incident. The sit-in on the main street of al-Tur was held concurrently with rallies at five schools in the village, where students carried out sit-ins in school yards in protest against the closure of the village's entrance. Suleiman al-Farsi Street is considered the main entrance to the village, and local activists told Ma'an that the closure of the road negatively affected the ability of 3,000 local residents to live normally. The closure also prevents ambulances and fire trucks from reaching the village. The thoroughfare is also the main road leading to the Suleiman al-Farsi mosque, the village cemetery, and two elementary schools where some 1,200 students attend. The closure of the roads followed widespread protests against the killing of Muhammad Abu Ghannam on Saturday as he crossed the al-Zayyim checkpoint on foot resulted in widespread protests. A soldier at the checkpoint reportedly insulted Abu Ghannam's sister, leading to a scuffle, while Israeli authorities have alleged the boy pulled a knife on the soldier.Israeli municipal authorities routinely close and block major roads leading into Palestinian neighborhoods of occupied East Jerusalem. In addition to Al-Tur, another major road into the nearby town of al-Issawiya was also shut closed.Abu Ghannam was one of three Palestinians shot dead by Israeli forces in the last week. Although Palestinians in occupied East Jerusalem live within territory Israel has unilaterally annexed, they lack citizenship rights and are instead classified only as "residents" whose permits can be revoked if they move away from the city for more than a few years. Jerusalem Palestinians face discrimination in all aspects of life including housing, employment, and services, and are unable to access services in the West Bank due to the construction of Israel's separation wall. Tensions have been running high in East Jerusalem since last summer when Jewish extremists raided the area and kidnapped and murdered a 16-year-old Palestinian boy, Muhammad Abu Khdeir.Israeli forces have detained hundreds of Palestinians across East Jerusalem who have taken part in protests, especially against Israel's summer assault on Gaza, including 600 alone in the two months after Abu Khdeir's death. Prisoners Media Office revealed that the sick detainee Hamza al-Kalouti, 45, suspended his open hunger strike which he started on Tuesday. The suspension came after promises from Israeli Prison Service (IPS) to provide him with the required treatment. The Office said that Kalouti suspended the strike based on an agreement with the IPS to transfer him in an ambulance to an Israeli hospital outside jail to conduct a surgery. Kalouti started an open hunger strike on Tuesday to protest the policy of medical neglect adopted by IPS against Palestinian sick prisoners. He has been suffering from several diseases including asthma, gout, arthritis, high blood pressure, and severe pains in the colon and stomach for the past four years. Captive Kalouti was arrested on September 11, 2001 and sentenced to six life imprisonment terms. 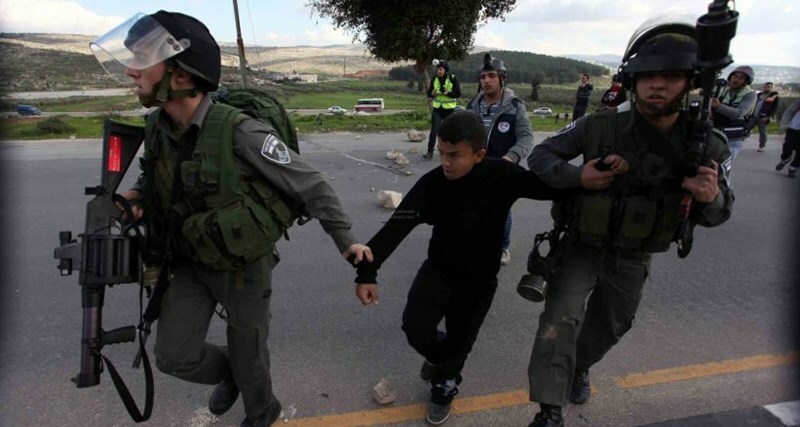 The Israeli occupation forces (IOF) at dawn Tuesday rounded up seven Palestinians from the West Bank and Occupied Jerusalem, including a 15-year-old minor. Sources based in Occupied Jerusalem said the IOF troops rolled into al-Issawiya town and scoured a number of Palestinian homes shortly before they kidnapped the citizens Ali Mahmoud, Morad al-Shloudi, Mahmoud Abdul Rauf, and Mohamed Atiyeh. Tension has been running high in the area after the IOF shot the Palestinian boy Ali Abu Ghannam dead on allegations of attempting to stab an Israeli officer at the Zaim checkpoint, in eastern Jerusalem. 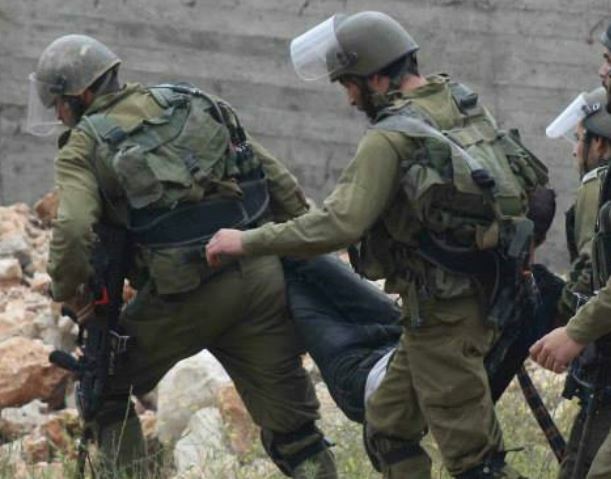 The IOF campaign culminated in the abduction of the 15-year-old minor Maher Samer Sarhan shortly after he was heavily beaten by the Israeli soldiers. “The soldiers hit me with their boots and batons as soon as I tried to inquire about the reason for the arrest, especially that no clashes or protests cropped up in the area,” the Wadi Helwa Information Center quoted Sarhan as reporting. Meanwhile, the Israeli occupation army apprehended two allegedly wanted Palestinian citizens from the southern West Bank cities of Bethlehem and al-Khalil after having broken into and wreaked havoc on their family homes. Israeli forces on Wednesday detained 19 Palestinians in raids across the West Bank, including nine in the town of Beit Ummar near Hebron and seven near Qaliqiliya.Local activist Muhammad Ayyad Awad told Ma'an that Israeli soldiers entered Beit Ummar before dawn and raided a number of private homes in different neighborhoods across the town, which is located along the main road between Bethlehem and Hebron.Awad said that nine Palestinians were arrested during the raids, including five men who had been formerly imprisoned in Israeli jails. The five detainees who were previously in prison were identified as Nassim Taha Muhammad Taha Abu Maria, 17, who was released three months ago after spending one year in Israeli custody, Youssef Muhammad Kamel Awad, 24, a former prisoner who spent three years in Israeli jails, Nour Youssef Khdeir Awad, 23, former prisoner, Ayham Khalil Abd al-Fattah Sabarneh, 21, and former prisoner Hassan Adam Salem Ikhleil, who was released a month ago and has three other brothers in Israeli jails. The remaining four detained individuals were identified as Maan Ahmad Muhammad Abu Ayyash, 25, Yahiya Kamel Zaqiq, 18, Muhannad Abd al-Fattah Hassan Arar, 16, and Mahdi Ziyad Mahmoud Ikhmayis, 19. The detainees were taken to the Etzion military camp north of Beit Ummar.Awad added that clashes erupted between Palestinian youths and Israeli soldiers before the military forces left the town.No injuries were reported.Israeli forces also raided the town of Beit Duqqu northwest of Jerusalem early Wednesday.Locals told Ma'an that Israeli forces raided the town and detained Nour Jamal Rayyan, 21. They took him to an unidentified location. Clashes erupted between youths and Israeli soldiers during the raid. Soldiers fired a large number of tear-gas bombs at local protesters as well as nearby houses, causing many to suffer from excessive tear-gas inhalation. Meanwhile, Kazem and Naji Mufid Radwan, Yazan Bilal Radwan, Sari Ziyad Radwan, Yasser Faisal Salim, Muhammad Saber Radwan and Ammad Yasser Salim were detained in the Qalqiliya town of Azzun and Abdullah al-Juneidi was detained in Hebron. Most of the detainees are former prisoners. 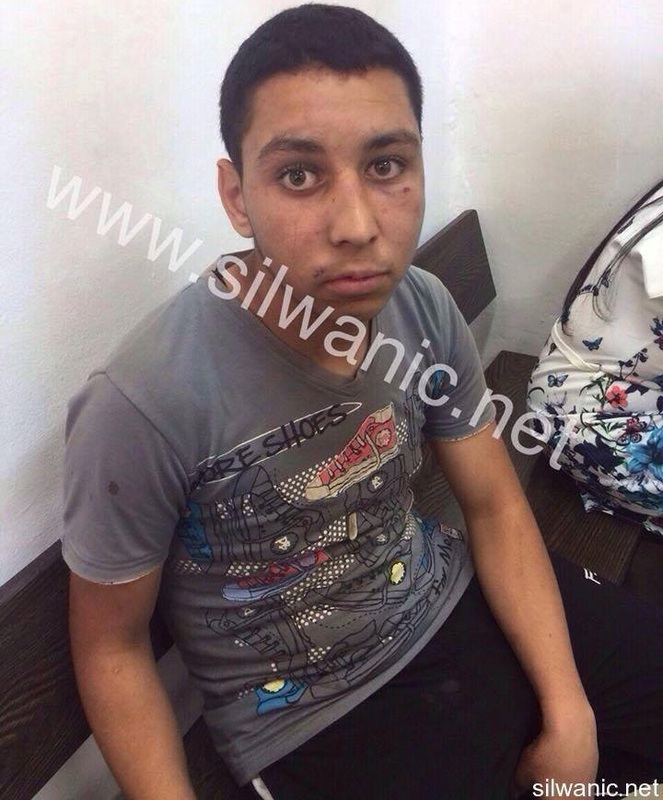 Israeli forces also detained Ahmad Fuad Adwin from the Azza refugee camp in Bethlehem. An Israeli military spokeswoman did not immediately return a request for comment. Israeli soldiers kidnapped, on Wednesday at dawn, nine Palestinians in Hebron, three in Bethlehem, and one Nablus. Clashes took place in Nablus, and the soldiers conducted live fire training in different areas of Jenin. Mohammad ‘Ayyad ‘Awad, spokesperson of the Popular Committee against the Wall and Settlements in Beit Ummar town, north of southern West Bank city of Hebron, said the soldiers invaded various neighborhoods in the town, stormed and violently searched scores of homes, and kidnapped nine Palestinians, including five former political prisoners. ‘Awad said the kidnapped former political prisoners have been identified as Nassim Taha Abu Mariyya, 17, Yousef Mohammad Kamel ‘Awad, 24, Nour Yousef ‘Awad, 23, Ayham Khalil Sabarna, 21, and Hassan Adam Khalil. The soldiers also kidnapped Ma’an Ahmad Abu ‘Ayyash, 25, Yahia Mohammad Za’aqeeq, 18, Mohannad Abdul-Fattah ‘Arar, 16, and Mahdi Ziad Ekhmayyes, 19 years of age. Several military vehicles also invaded the al-‘Azza refugee camp, north of Bethlehem, and kidnapped one Palestinian identified as Ahmad Fuad ‘Adwein, 24 years of age, after violently searching his home. Furthermore, soldiers invaded Teqoua’ town, east of Bethlehem, broke into and searched several homes, causing excessive property damage, and kidnapped two Palestinians, identified as Aamer Salim Jibrin, 29, and ‘Odai Mahmoud Abu Mfarreh, 24 years of age. In addition, soldiers invaded the al-Far’a refugee camp, northeast of the northern West Bank city of Nablus, also stormed into and searched several homes, and kidnapped a young man identified as Anas Mohammad ‘Abbas. The invasion led to clashes between local youths and the soldiers; the youths hurled stones, empty bottles and Molotov cocktails on the invading army vehicles, while the soldiers fired rounds of live ammunition, and concussion grenades. Several military vehicles also invaded the Dahiya area, east of Nablus, while military helicopters hovered overhead. Clashes took place in the Schools and az-Zaghloul streets, in Nablus, in addition to the Market Street in the Balata refugee camp. The army also invaded Jaba’ town, south of the northern West Bank city of Jenin, and searched the home of political prisoner, Mohammad ‘Asad Ghannam, before interrogating his family. It is worth mentioning that dozens of soldiers conducted training using live fire, helicopters and paratroopers, in the al-Jabreyyat neighborhood in Jenin city, and the nearby villages of Msalya and Qabatia, in addition to an area near a military base, behind the Annexation Wall. The military base was built on Palestinian lands belonging to residents of Barta’a ash-Sharqiyya village. Two Palestinian prisoners in the Etzion detention center have told a Palestinian Authority prisoners' committee that they were beaten by Israeli forces during interrogation. A lawyer with the PA Detainees and Ex-detainees Affairs Committee Hussein al-Sheikh reported that prisoner Yazan Yusri Taha, 22, from Hebron was severely beaten on his head and body when he was detained on April 19. Taha, who was seized by Israeli forces in front of the judicial court in Hebron, told al-Sheikh that he was beaten while being taken to the Kiryat Arba police station in an Israeli military vehicle. Al-Sheikh also relayed that Sharaf al-Fakhouri, 23, from Hebron was beaten on his back and face when he and his brother were detained from the al-Seil area in the Old City of Hebron.Al-Fakhouri reported that they were assaulted and beaten on the head and chest with the soldiers' rifle butts. Palestinian prisoners frequently report Israeli practices inside prison facilities that are tantamount to torture.According to human rights group Addameer, "The forms of torture and ill treatment employed against Palestinian prisoners" include "beatings, tying prisoners in 'stress positions', interrogation sessions that last up to 12 consecutive hours, depriving prisoners of sleep and other sensory deprivation, isolation and solitary confinement, and threats against the lives of their relatives." Addameer adds: "In past instances, detainees have died while in custody as a result of torture," noting that such practices are in contravention of international law, "including the United Nations Convention against Torture (CAT), ratified by Israel on 3 October 1991." The Detainees and Ex-detainees Affairs Committee reported in January that Palestinian children in Israeli jails are also subjected to torture and physical abuse. The head of the Legal Unit of the Prisoner Support and Human Rights Association (Ad-Dameer), Lawyer Mahmoud Hassan, stated Tuesday that the Ofer Israeli military court decided to postpone the Wednesday trial of Legislator Khaleda Jarrar until further notice. 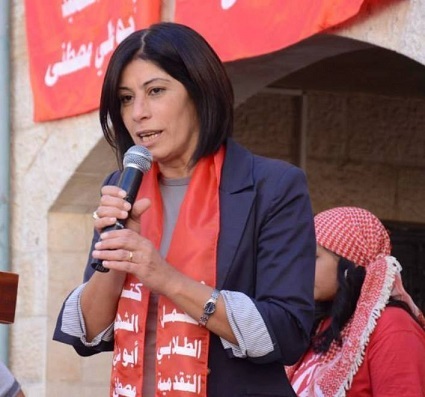 The army kidnapped the 52-year-old legislator, senior political leader of the Popular Front for the Liberation of Palestine (PFLP), and a democratically elected legislator, on April 2, 2015. Hassan said the defense team has asked the Military Judge in Ofer for a continuance as the military prosecutor never provided additional materials related to the case of the detained official. Three days after the soldiers abducted Jarrar from her home in central West Bank city of Ramallah, the Israeli military court issued a six-month arbitrary Administrative Detention against her, holding her without charges. The Wadi Hilweh Information Center (Silwanic) have reported that the soldiers stormed a number of homes, and searched them, in the al-‘Eesawiyya town, in occupied Jerusalem, and kidnapped four young man. The four have been identified as Murad Shalloudi, Mohammad Abdul-Raouf, Mohammad ‘Atiyya and Ali Mohammad Mahmoud. In addition, soldiers invaded the al-‘Azza refugee camp, north of Bethlehem, and kidnapped one Palestinian after breaking into his home, and searching it. The kidnapped Palestinian has been identified as Ibrahim Fuad ‘Amrin, 22 years of age. Several armored military vehicles also invaded Beit Ummar town, north of the southern West Bank city of Hebron, and kidnapped a Palestinian man, identified as Nasser Mohammad Abu ‘Ayyash, 50 years of age. Mohammad ‘Awad, spokesperson of the Popular Committee against the Wall and Settlements in Beit Ummar, said the soldiers also confiscated the Abu ‘Ayyash’s car, before moving him to the Etzion military base, north of Hebron. 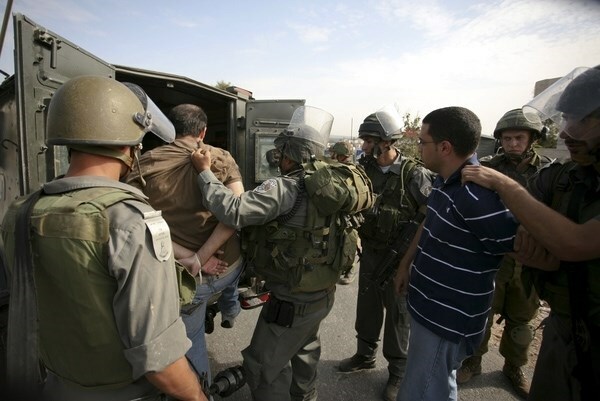 The army conducts daily invasions and arrests in different parts of the occupied West Bank, including in and around occupied East Jerusalem, as part of ongoing violations against the Palestinians and their property. 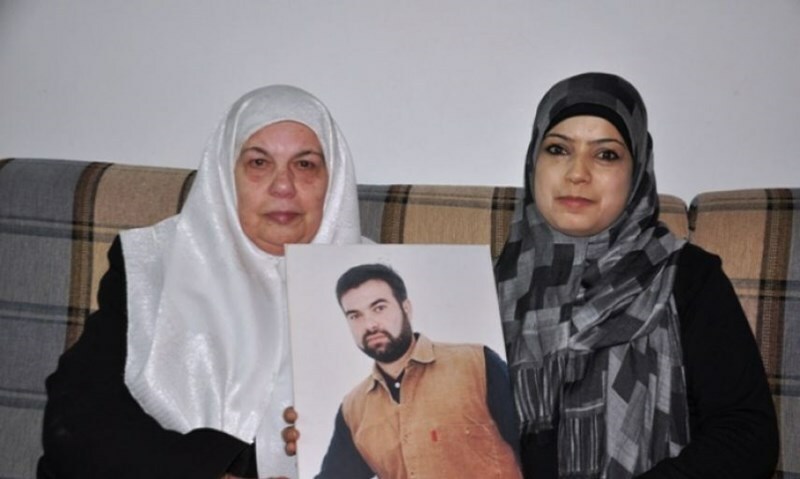 Prisoners Media Office revealed that the sick detainee Hamza al-Kalouti started an open hunger strike on Tuesday to protest the policy of medical neglect adopted by Israeli Prison Service (IPS). The Office mentioned that Kalouti, 45, from Jerusalem, has been suffering from several diseases including asthma, gout, arthritis, high blood pressure, and severe pains in the colon and stomach for four years. The IPS, however, has been procrastinating in providing him with treatment. Instead, he receives pain killers only. The Office charged the IPS with full responsibility over the life of prisoner Kalouti and called on the human rights organizations to pressure the Israeli occupation to halt its punitive practices against Palestinian detainees. The IPS executes Palestinian captives very slowly by the policy of systematic medical negligence. Many of the patient prisoners died inside jail or shortly after being released due to health deterioration. The last case was martyr Jaafar Awad. 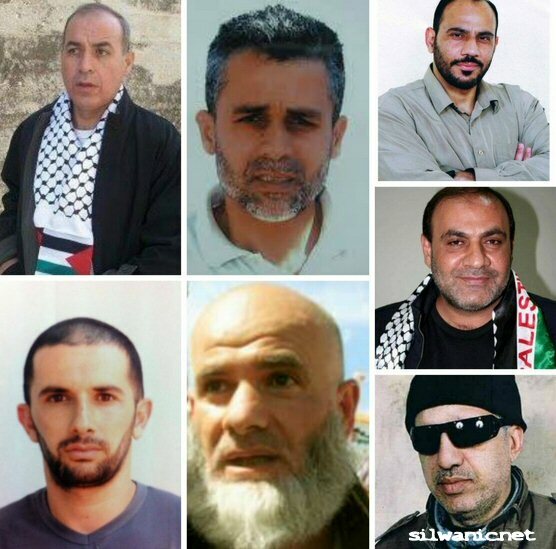 Palestinian prisoners, affiliated with Jihad Movement, stated that a number of their colleagues were transferred to hospital after being injured during an Israeli violent night raid on section 6 in Negev prison. In a letter sent to Muhjet al-Quds Institution, the prisoners affirmed that a state of tension has been prevailing since Sunday evening as the Israeli Prison Service (IPS) imposed a set of punitive measures and tight sanctions on prisoners held in Negev prison. The punitive measures include confiscating the prisoners’ personal belongings, handcuffing all the prisoners held in section 24, depriving the prisoners from purchasing food and other basic necessities from the prison canteen. The IPS cut off electricity in Negev prison as a prelude to its Special Forces’ violent break-in into the wards, the institution reported. 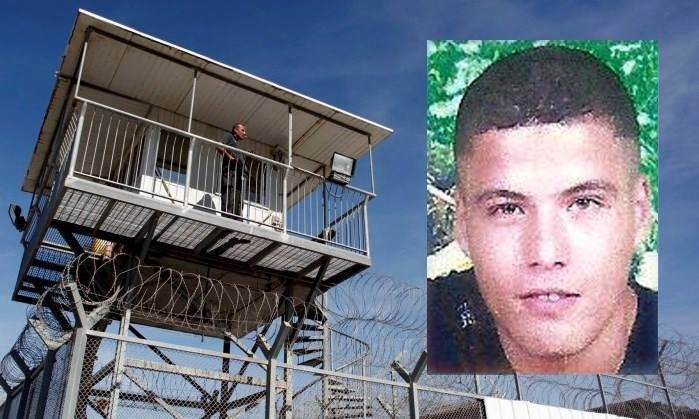 During a night right, Israeli forces deliberately provoked Palestinian prisoners held in Negev prison, enraging the prisoner Fares Sada, 20, who, in response, attacked one of the soldiers with a sharp object. The Israeli soldiers immediately intervened and violently attacked Fares before taking him to solitary confinement. Muhjet Quds Institution held the IPS fully responsible over Fares’s life, considering the stab operation as a natural reaction to the Israeli punitive measures and provocative practices against Palestinian prisoners.